This was another recycled/found and no-spend challenge. The thread for this Craft Pimp February 2014 challenge is here. I have a small collection of beach pebbles I picked up at Brighton, so decided to use three of those. They’re a dark grey-brown-green and still quite glossy. 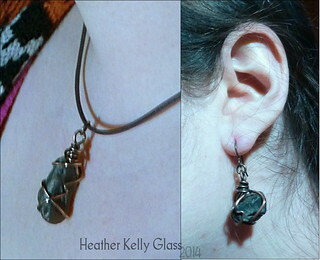 I picked out a longer one for a pendant and two of roughly the same size for earrings. 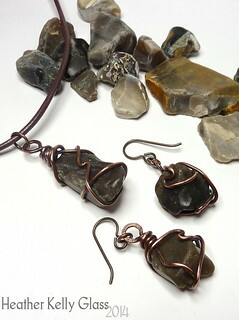 I used copper wire to wrap them securely, then patinated them with liver of sulphur until they were really black. I tumbled them to bring the copper back up to gunmetal, and hand-polished the top surfaces back some more. 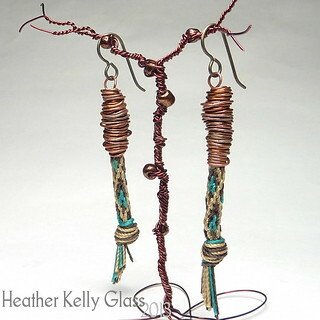 The earwires are my niobium ones, which go well with antiqued copper. I hung the pendant on brown Greek leather cord. We had to include a picture of it being worn, which is a bit tricky to photograph one’s self! So excuse the blurriness. Only one more pair to go! Patinated copper and lampwork glass this time. 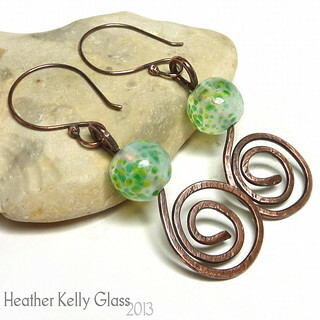 I got out the heftier copper wire and made a pair of hammered spirals with two of my lampwork glass beads on them. 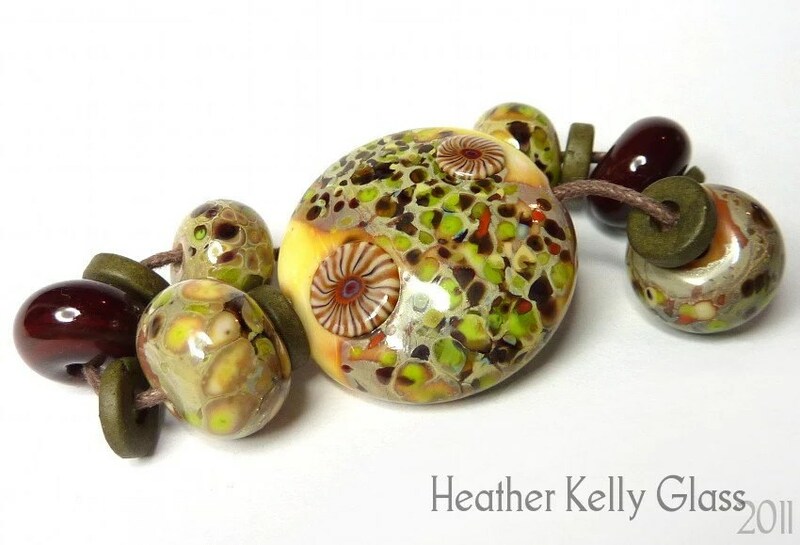 The beads have a mix of green frit on a misty translucent background. I made big rounded earwires, put them in liver of sulphur to patinate until black, then tumbled them for a bit for a gunmetal finish before giving the surfaces a quick going-over with a sanding sponge to bring back a little copper. I used another pair of my lampwork headpins for these earrings. My headpins are the round red base of the earrings, on stainless steel which has a dark patina from the heat. I left them dark rather than polishing them up and put the fritty red and white beads on them before wrapping the rest of the wire into a loop. 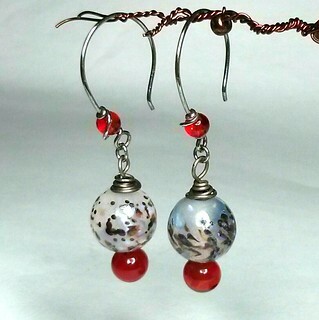 I made the round earwires in sterling silver with little red Czech glass beads wrapped on. I patinated the silver with liver of sulphur and then tumbled it to give the shiny antique silver finish here. This was a 16-strand kumihimo pattern where I had the marudai instructions but did it on a disc. It has little arrows in white, yellow, orange and russet brown, surrounded in blue. I wire-wrapped the earrings in flame-patinated copper and the earrings were darkened with liver of sulphur and then tumbled. This pair have been sitting about waiting for me to first LOS them and then tumble them, but here we are! 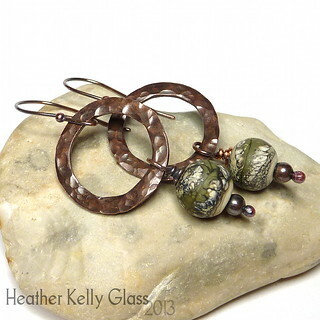 I hammered the copper rings for texture and wire-wrapped a pair of my lampwork beads – these two were a go at olive tiger beads. 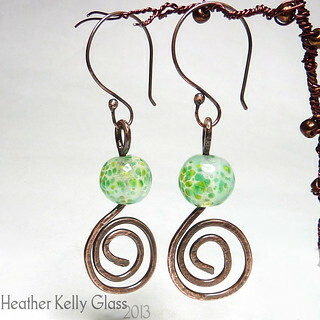 They’ve got little hollow copper beads on the dangles alongside the lampwork. I made the earwires and put everything together, then used liver of sulphur to give a full black patina, then put them in the tumbler to polish them back up to something more like a warm gunmetal/dark bronze. A lot of my friends are doing kumihimo at the moment, there was a full kit on sale a few months ago… I’m sure you can guess the rest. Kumihimo is rather addictive and I can do it in my lunch breaks. 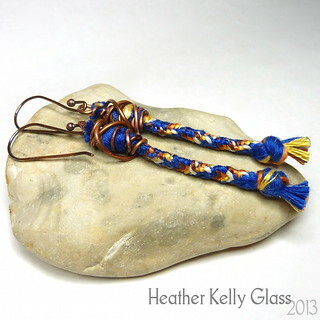 (It takes me back to the knotted friendship bracelets I used to make when I was a teenager, too). I made a few long braids, then decided that the pattern on this one would look good in short earring-length pieces. I said I was going to patinate last week’s earrings with liver of sulphur. I have the gel variety, followed the instructions and put them in a little pot with warm water and a few drops of gel. So far so good. I put in some textured washers I’d made beforehand too. They sat in there for a while and I noticed that the earrings weren’t getting any darker, unlike the washers. I’d got this wire in a sample pack of different sizes: some of them are anti-tarnish, some aren’t, and they don’t say so on the packaging. I got everything back out, neutralised in bicarb solution and went looking for how you remove the coating. I tried attacking it with micromesh, steel wool, nail polish remover and had another go. This time I used much hotter water and got little bits of black, but only on the top side of the topmost wrap of wire. So my previous earrings are now backwards from the usual finish, where everything goes dark and then you polish back the highlights! These earrings were made with the same wire and the copper was too bright for the braid, so I’d wanted to patinate these ones too. I’d been going to just paint the LoS on the surface of these, because I didn’t want to soak the cord in the solution in case it absorbed the smell. But after all the faffing about above I obviously wasn’t going to be able to get the effect I wanted this way! Instead, I knew the coating burns off easily because I’ve seen that before when balling up wire, so I unwrapped all the wire, carefully went along straightening both pieces out with my pliers and then passed them through my torch flame in sections. The coating burns off quickly (and with a green flare) and at the same time the wire gets flame patinated and reannealed. I ended up with darkened varicolour wire that was easy to wrap back around my braids. Hooray! They will probably get darker still over time. These are shown on my niobium earwires and I am wearing them right now. They’re nice and light for long earrings.